When we are in Jordan we will squeeze in any opportunity to fly, but this year it was particularly important to do a few flights as we have sadly lost the use of the wonderful beast of helicoptering - the Huey, and we had to test our new machines and pilots of the Eurocopters. One of the RJAF Hueys in flight during the 2010 season. Photographer: Don Boyer. 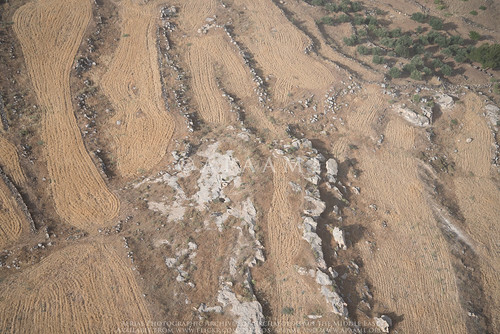 APAAME_20101016_DDB-0045. 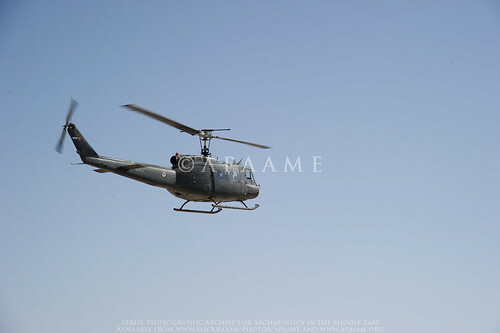 The Huey has been our principal form of aerial reconnaissance since the Aerial Archaeology in Jordan project started in 1997. The advantages of the Huey were its spacious interior, large opening (once the door was open) and outward facing seats that allowed four photographers to operate together. Given these machines had been in operation during the Vietnam War (see our blog 'I Love the Smell of Nabataea in the Morning'), and one had a bullet hole to prove it, we knew we would have to move on eventually. They had their quirks, like the communication systems being flakey, shaking you about so that you could feel the movement for several hours after landing, and the noise! We felt a pang of grief for the loss of a trusted friend that had transported us over the varied sites and landscapes of Jordan. If anyone has a few million pounds to service a small fleet of Hueys for us, I am sure we could make good use of it! Our old squadron, 8 Squadron (السرب الثامن) which flew the Hueys and with whom we have shared many fantastic years of flying has moved on too. We now are the passengers of 14 Squadron (السرب الرابع عشر) and their Eurocopter 635. The Eurocopter is a smaller but twin-engined aircraft but only two photographers can now attend any flight. This limits the ability to have a person acting purely in the role of 'spotter' as the others handle the navigation and communication with the pilots. The aircraft is primarily for transport, so the large and comfortable backward facing seats are removed. This gives room to allow us to sit on the floor facing out the door, legs braced against the landing skid, while our trusty crew member makes sure our body harnesses keep us safe and strapped into the aircraft. The speed, comfort, stability and quiet however are far superior to the Huey. The crewmen may beg to differ I am sure as on two occasions they have suffered airsickness from the constant circling required for us to photograph our target sites! I am sure you are all wondering why we do not upgrade to a Blackhawk, but it is probably too much of a beast for our aerial reconnaissance and burns through the fuel to match! 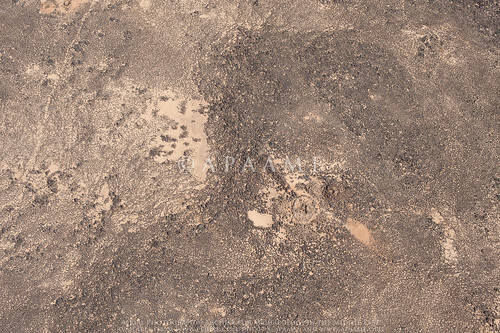 Photograph distribution of Aerial Archaeology in Jordan May 2016 flights. Imagery: Google Earth. The other challenge for us this season was the unseasonably late spring that saw cloud interrupting two of our three flights. Cloud can be a problem for two main reasons - the first is visibility, both in terms of sites but also safety of navigation, and the second is the quality of the resulting images for analysis. Our first flight to the north suffered from very 'flat' light at first, then the last leg of the scheduled flight was abandoned altogether as the cloud lifted but did not clear causing harsh contrasts between sun and shade, and making photographing sites well all but impossible. The third flight had the majority of scheduled sites abandoned due to low cloud that made reconnaissance simply unsafe. These were over the Kerak plateau and into the Dead Sea valley where we were hoping to fly sites that had been requested and under current investigation by colleagues, but these will have to be left for September when we hope the skies will be clearer. 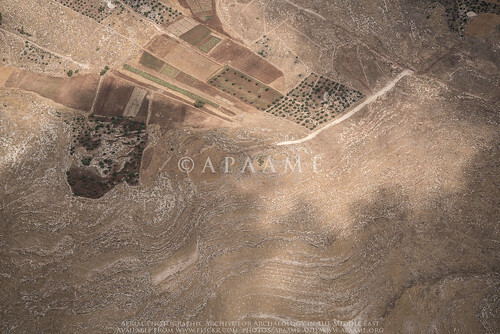 Poor light at Khirbet Um al-Ghozlan obscures the site. Photographer: Robert Bewley. APAAME_20160523_RHB-0417. This season was once again, however, successful as the archaeology of Jordan never ceases to amaze. We completed 13.34 hours of flying, over three separate days, taking just over 2700 photographs of 487 features. 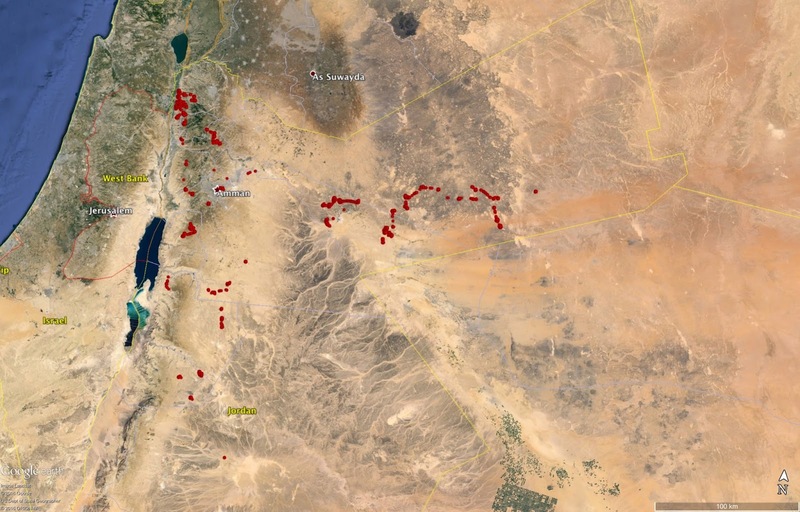 We covered areas in the north, east and central areas of Jordan. Our reconnaissance team included Robert Bewley, Andrea Zerbini and Rebecca Banks. 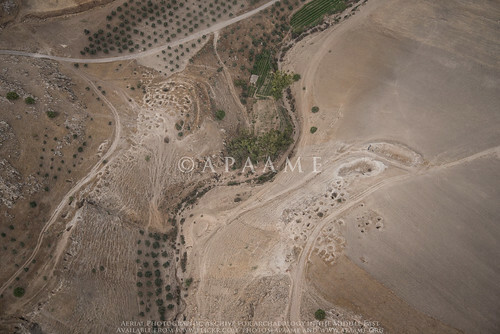 You can find the 2016 photographs on our Flickr: https://www.flickr.com/photos/apaame/collections/72157666359145684/. Some choice examples from each of the flights are below. 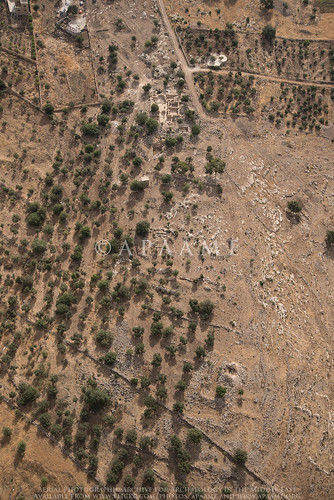 The excavated site of Khirbat al-Dawayr. Photographer: Andrea Zerbini. 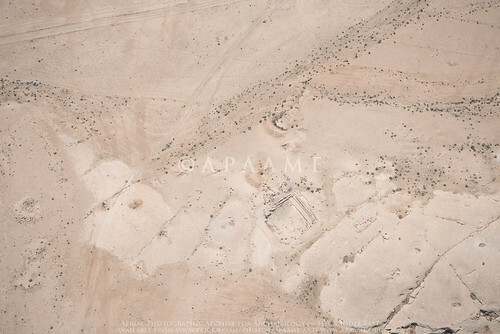 APAAME_20160523_AZ-0105. As yet unidentified (by us) site near Pella. Photographer: Andrea Zerbini. APAAME_20160523_AZ-0170. A pendant partially excavated. Photographer: Robert Bewley. APAAME_20160526_RHB-0254. 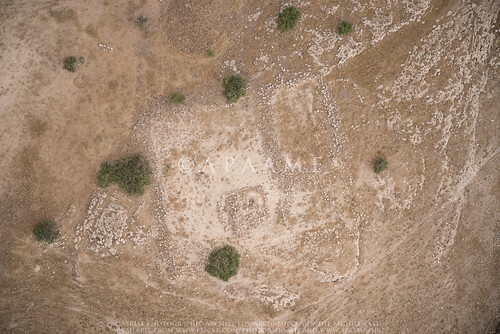 A well-preserved possibly Nabataean site. Photographer: Andrea Zerbini. 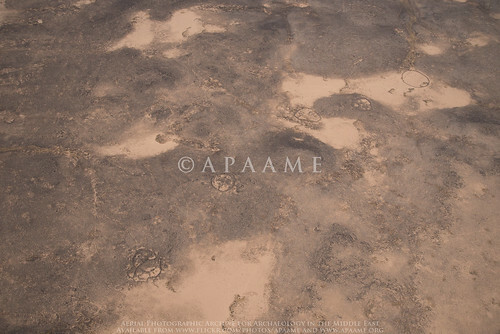 APAAME_20160529_AZ-0082. The site of Ruweihi along the Wadi el-Hasa. Unfortunately looting is occurring in the vicinity of the site. Photographer: Andrea Zerbini. 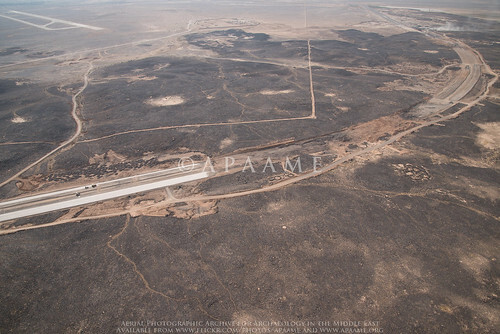 APAAME_20160529_AZ-0111. 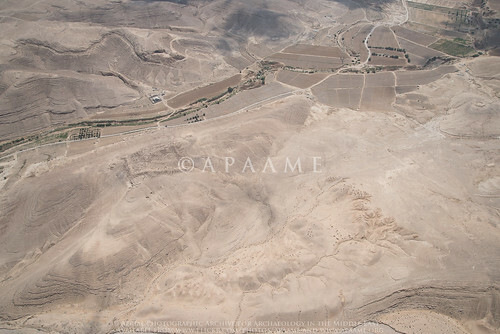 A quarry, first surveyed in the Limes Arabicus Project (LA-315-316), that was possibly used as a reservoir. Photographer: Andrea Zerbini. APAAME_20160529_AZ-0172. If you look closely in this image, you can see a large basalt stone, possibly used once in an olive press or for another agricultural process. Photographer: Andrea Zerbini. APAAME_20160529_AZ-0066. Unfortunately each flight also captured damage to archaeology. This is something the Endangered Archaeology in the Middle East and North Africa project, with whom we work, is particularly interested in documenting. Some examples of site damage from this season are below. Old looting at the cemetery of Hammeh. Photographer: Andrea Zerbini. 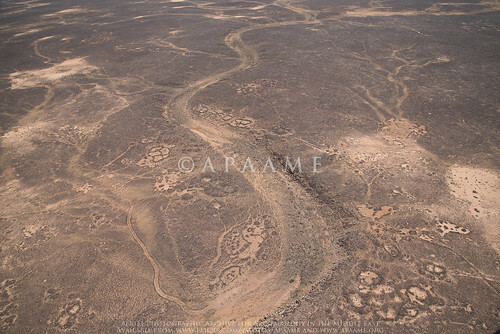 APAAME_20160523_AZ-0160. 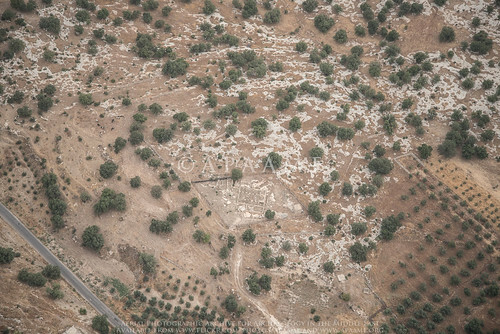 The site of Deir el-Asal surrounded by later military trenches. Photographer: Robert Bewley. APAAME_20160523_RHB-0257. Possible stone robbing, looting and impact from tracks on the road tower Rujm Mudawar. Photographer: Rebecca Banks. APAAME_20160526_REB-0083. 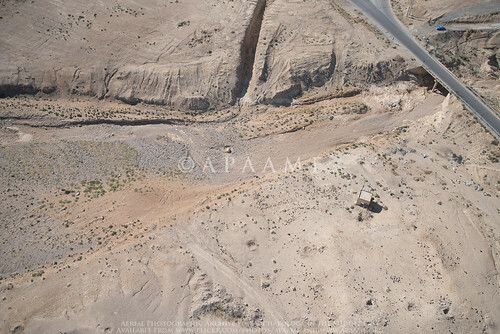 The Azraq by-pass cutting through the Harrah Uweinid. Photographer: Rebecca Banks. APAAME_20160526_REB-0159. 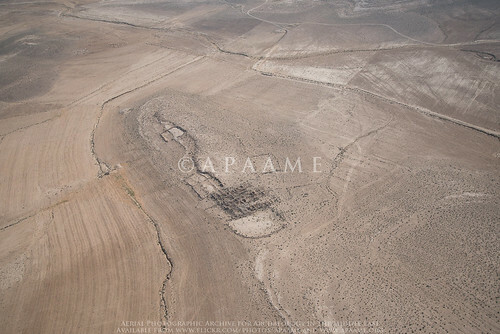 The almost erased site of Qasr el-Bint (faint rectangular feature in lower right of photograph) at Jurf ed-Darawish. The site has most probably suffered from stone robbing, possibly in the building of the nearby village. Photographer: Andrea Zerbini. 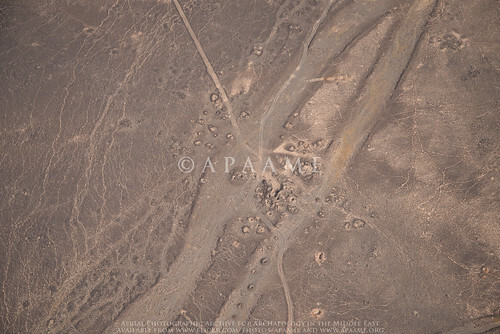 Reference: APAAME_20160529_AZ-0092. During this visit we had an amazing response from many teams working in Jordan, both in person at the International Conference on the History and Archaeology of Jordan (ICHAJ) and through personal communication. These colleagues alert us to the sites we do not know about or that have changed and need revisiting. This season, both short and interrupted by the weather, was not able to fulfil all the requests for imagery, but we look forward to returning in September. This will enable us to continue to contribute to the many investigations occurring in Jordan by international and local teams. 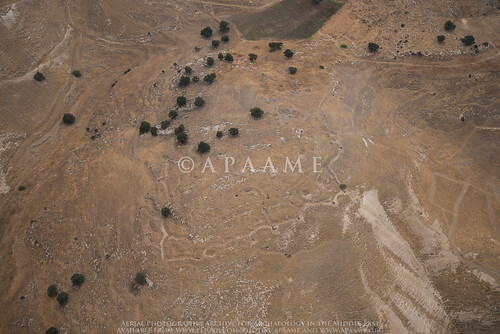 It is a pleasure to be involved in helping to record the varied archaeology and heritage of Jordan. As always, thanks to the Royal Jordanian Air Force for their hospitality and superior skill in the sky that allows us to continue.